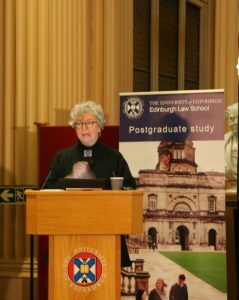 The Global Justice Academy (GJA) and Edinburgh Law School welcomed over 200 human rights academics and practitioners to the University of Edinburgh for the 2018 Association of Human Rights Institutes (AHRI) Annual Conference on the 6-8 September 2018. The GJA is the current Secretariat of AHRI in conjunction with the Centre for the Study of Human Rights Law (CSHRL) at the University of Strathclyde. The theme of this year’s conference was ‘Renewing Rights in Times of Transition: 70 Years of the Universal Declaration of Human Rights’. The conference began with Works in Progress sessions on 6 September followed by the launch of the Peace Agreements Database (PA-X). Professor Charlie Jeffrey, Senior Vice-Principal of the University of Edinburgh, welcomed AHRI conference delegates at the opening reception in the Playfair Library of the Old College. The official start to the conference heard interventions on Challenges to Human Rights in Times of Transition with panel speakers including Francesca Klug, OBE, Jacquelyn MacLennan of White & Case, LLP, and Michael O’Flaherty, Director of the European Union Fundamental Rights Agency. 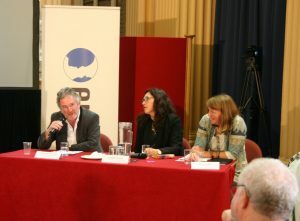 The panel examined key challenges to contemporary human rights protection. Klug identified these as bureaucracy, legalism, irrelevance, nationalism and globalisation (or BLING). MacLennan outlined ways in which practitioners could contribute to ending modern slavery, the most egregious assault on human rights. O’Flaherty highlighted how human rights academics must do a better job at communicating their research to the public in order to drive home the importance of human rights protection to everyone, not just the oppressed and marginalised. Following the opening plenary session over 110 presenters delivered papers on a comprehensive ranges of topics, including, among many others: the role of non-state actors in times of transition; the evolution of environmental rights, interpretations of human dignity, the rights of the displaced and minority rights; expanding ideas of accountability and redress; reconsideration of the tension between human rights and democracy; and human rights in post-conflict settings. Audiences heard from academics and practitioners ranging from PhD candidates to emeritus professors from across all continents. The programme reinforced AHRI’s aims of inclusivity and global expansion to deliver a more cross-representative research presentation setting. The final plenary panel session heard optimistic views on Moving Forward in Times of Transition from Alan Miller, Special Envoy of the Global Alliance of the National Human Rights Institutions, Elizabeth Salmón, Professor of International Law at the Pontifical Catholic University of Peru, and Rhona Smith, UN Special Rapporteur on the situation of human rights in Cambodia. The major theme across the closing panel was that everyone has a role to play in promoting human rights, no matter how large or small. It is through the collective influence of all human rights defenders that human rights will triumph over the anti-rights movements threatening the safety of so many people today. Salmón noted in particular the inclusion imperative that must be acknowledged across human rights discourse, specifically pointing to transitional justice. This role of everyday people promoting human rights in their everyday lives was reinforced in the closing address ‘Nevertheless, She Persisted’ delivered by Anna Eleanor Roosevelt (known as Anne). In a moving conference closing, the granddaughter of the late Eleanor Roosevelt, who was instrumental in the drafting of the Universal Declaration of Human Rights, implored the audience to ‘channel Eleanor Roosevelt’ everyday in their pursuit of ensuring human dignity for all. With the addition of these nine new members, AHRI now spans six continents and 70 institutions. AHRI 2018 proved to be an inspiring reflection of the legacy of the Universal Declaration of Human Rights and the work that is taking place across the globe to improve the lives of all people in all places. It is up to each of us to STAND UP and MAKE OUR VOICES HEARD.